I’m Napa Needlepoint’s newest project Mosaic Memories II and I was finished Saturday. My designer thought, before she started designing at all, that these lovely pieces sprang fully-formed from the designer’s head. I thought I’d share with you the process of how I came to be. I started out because my designer saw some great scrapbook layouts that reminded her of quilts. She made one last month for her Quilty Club & decided to do a second; this one smaller. Her first step was to pick the layout. Since she really liked those little squares, she picked one that had plenty of them. The next step was to figure out the size of that block. Since her canvas was small & the design is 10×10 blocks, she needed to count to see what would fit. By counting she knew the maximum size of the block was 7 threads. She went on to pick a stitch that would fit. Her plan for the first project used an overdyed thread for all the square blocks, but she found the result quieter than she wanted. This time she picked a bold overdye, Tahiti from Caron. Based on that skein, she picked several other threads. First the squares on the left were stitched — no problem. To find where the small center squares would go, the long skinny rectangle needed to be started at least. Here’s where the first problem happened. The stitch, a Byzantine-Tent variation, and the thread, Planet Earth Silk, did not work. The stitch was fussy & the thread too thick. For now it served its purpose, but it will need to be cut out. She continued to the second group of threads and found another problem. The overdye, which emphasized warm colors in the skein, was emphasizing blue and green in the stitches. And the violet in the skein was nowhere to be seen. The thread colors for the larger blocks would need to be changed. Using a new color, she stitched the upper left block — no problem. The next block to be stitched was the center bottom block. Finding a stitch was difficult. Many she considered had very poor diagrams. This Mary Legallet stitch in Stitchpirations worked beautifully. By counting she was able to size the block. Next was the lower right block. But the first stitch tried and completely stitched, only came out right for half the block. Another stitch to pull out. 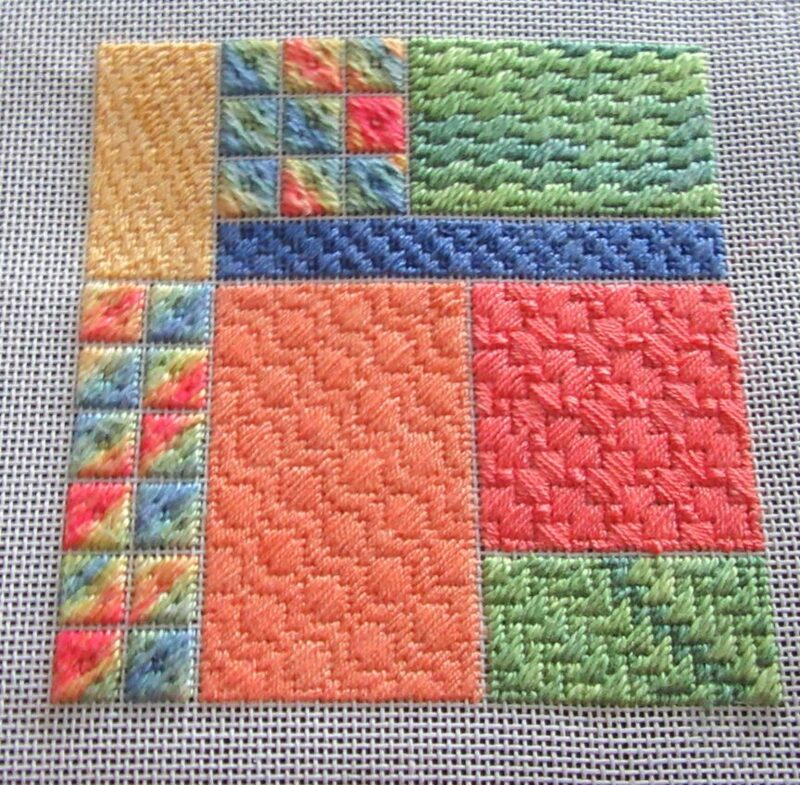 She started the upper right block, but that stitch was also confusing and she only stitched a little more than one unit. More cutting out to do. With three blocks to cut out, my designer spent some quality time with scissors and needle cutting out. With two bigger patches stitched and colors picked for the other three, a problem became clear. There wasn’t enough thread in either yellow or orange for the final patch. The violet she picked initially wouldn’t work either. My designer needed to pick a new color. She settled on a peachy pink. IUt’s pretty but I think it’s a bit too close to the orange next to it for me. New stitches needed to be found for the three patches that were cut out plus the unstitched patch. Stichpirations came to the rescue for the long rectangular patch. New threads were picked as well. The Milanese looked really nice in the lower left so a new variation was used. A variation of Triple Parisian was used in the upper left. The final patch used a stitch from Chandail Needlework in Houston. It’s been smooth sailing ever since. With the model stitched today she needs to diagram stitches and get the instructions out to club members. this is fabulous. i am going to print it out to keep reminding me about how to do it. i don’t need to have the whole picture worked out and can make changes. i am doing a design for a decor bag for a group of ladies for a class.